The Battle of Plassey (Pâlāshīr Juddha) was a battle that took place on June 23, 1757, on the banks of the Bhagirathi River, about 150 km north of Calcutta. It is near Murshidabad, then the capital of the Nawab of Bengal in India. Pâlāshir, an extravagant red flowering tree known as "Flame of the forest," gives its name to a small village near the battlefield. A phonetically accurate romanizing of the Bengali name would be Battle of Palashi, but the spelling "Plassey" is now conventional. The battle was between Siraj Ud Daulah, the last independent Nawab of Bengal, and the forces of the British East India Company. Siraj-ud-Daulah's army commander had defected to the British, causing his army to collapse. After this defeat, the entire province of Bengal passed to the Company, and this battle is today seen as one of the pivotal battles leading to the British Empire in India. The enormous wealth gained from the Bengal treasury after its victory in the battle allowed the Company to significantly strengthen its military might. The battle was waged during the period when the British and French governments were fighting the Seven Years' War in Europe (1756–1763). The French East India Company (La Compagnie des Indes Orientales) sent a small contingent to fight against the British East India Company. The British victory both eliminated French competition in India and resulted in a treaty arrangement with the Moghul Empire that left the East India Company de facto ruler of the province of Bengal. From this base, the Company set about extending effective rule over the whole of the Indian Sub-Continent. The Battle of Plassey was one of the major steps that brought England to dominate and conquer India. It was not only a battle with local authorities but part of the rivalry with France over available markets. However, European colonial expansion was a part of an even bigger phenomenon that would bind the peoples and cultures of the world together through dissemination of technology and sharing among cultures. In years to come it would bring the Western colonialists to some awareness of their spiritual responsibility for other nations—for example, no matter how wide was the gap between the rich and poor in the West, in the East it was even wider. In this respect, the Battle of Plassey can be seen as one step in a sad but necessary process. However, the method of colonial conquest cannot be accepted in this age, when the peoples of the world recognize their interdependence and the need to establish a world of mutual prosperity and shared values, by peaceful means. The ostensible reason for the battle was Siraj-ud-Daulah's earlier attack and capture of Fort William, Calcutta (which he renamed to Alinagar) during June 1756, but the battle is today seen as part of the geopolitical ambition of the East India Company and the larger dynamics of colonial conquest. The illegal use of Mughal Imperial export trade permits (dastaks) granted to the British in 1717, for engaging in internal trade within India. The British cited this permit as their excuse for not paying taxes to the Bengal Nawab. British interference in the Nawab's court, and particularly their support for one of his aunts, Ghaseti Begum. The son of Ghaseti's treasurer had sought refuge in Fort William and Siraj demanded his return. During this capture of Fort William, of June 1756, an event occurred that came to be known as the Black Hole of Calcutta. A narrative by one John Zephaniah Holwell, plus the testimony of another survivor, Cooke, to a select committee of the House of Commons, coupled with subsequent verification by Robert Orme, placed 146 British prisoners into a room measuring 18 by 15 feet with only 23 surviving the night. The story was amplified in colonial literature, but the facts are widely disputed. In any event, the Black Hole incident, which is often cited as a reason for the Battle at Plassey, was not widely known until James Mill's History of India (1858), after which it became the grist of student texts on India. As the forces for the battle were building up, the British settlement at Fort William sought assistance from Presidency of Fort St. George at Madras, which sent Colonel Robert Clive and Admiral Charles Watson. They recaptured Calcutta on January 2, 1757, but the Nawab marched again on Calcutta on February 5, 1757, and were surprised by a dawn attack by the British, resulting in the Treaty of Alinagar. At the same time, Siraj Ud Daulah was facing conflicts on two fronts. On his Western border was the advancing army of the Afghan, Ahmad Shah Abdali who had captured and looted Delhi in 1756. So although he was humiliated by the Treaty, Siraj Ud Daulah sent the better part of his troops west under the command of his general, Raja Ram Narain. In the midst of all of this, there was an ongoing court intrigue at Siraj Ud Daulah's court at Murshidabad. Siraj was not a particularly well-loved ruler. Young (he succeeded his father in April, 1756 at age 27) and impetuous, he was prone to quickly make enemies. The most dangerous of these was his wealthy and influential aunt, Ghaseti Begum (Meherun-Nisa), who wanted another nephew, Shawkat Jang, installed as Nawab. Mir Jafar, commander-in-chief of the army, was also uneasy with Siraj, and was courted assiduously by Ghaseti. Eventually, through the connivance of traders such as Amichand (who had suffered as a result of the siege of Calcutta), and William Watts, Mir Jafar was brought into the British fold. The Company had long decided that a change of regime would be conducive to their interests in Bengal. In 1752, Robert Orme, in a letter to Clive, noted that the company would have to remove Siraj's grandfather, Alivardi Khan, in order to prosper. After the premature death of Alivardi Khan in April 1756, his nominated successor was Siraj-ud-Daulah, a grandson whom Alivardi had adopted. The circumstances of this transition gave rise to considerable controversy and the British began supporting the intrigues of Alivardi's eldest daughter, Ghaseti Begum against that of his grandson, Siraj. Instructions dated October 13, 1756, from Fort St. George instructed Robert Clive, "to effect a junction with any powers in the province of Bengal that might be dissatisfied with the violence of the Nawab's government or that might have pretensions to the Nawabship." Accordingly, Robert was negotiating with two potential contenders, one of Siraj's generals, Yar Latif Khan, and Siraj's grand-uncle and army chief, Mir Jafar Ali Khan, through William Watts, chief of the Kasimbazar factory of the Company, who was proficient in Bengali, and Persian languages. On April 23, 1757, the Select Committee of the Board of Directors of the British East India Company approved Coup d'état as its policy in Bengal. Mir Jafar, negotiating through an Armenian merchant, Khwaja Petruse, was the Company's final choice. Finally, on June 5, 1757, a written agreement was signed between the Company, represented by Clive, and Mir Jafar, ensuring that Mir Jafar would be appointed Nawab of Bengal, once Siraj Ud Daulah was deposed. The British army was vastly outnumbered, consisting of 2,200 Europeans and 800 native Indians and a small number of guns. The Nawab had an army of about 50,000 with some heavy artillery operated by about 40 French soldiers sent by the French East India Company. Mīr Muhammad Jafar Khān, with his detachment, stood at a distance towards the left from the main army; and although Sirāju-d-daulah summoned him to his side, Mīr Jafar did not move from his position. In the thick of the fighting, and in the heat of the work of carnage, whilst victory and triumph were visible on the side of the army of Sirāju-d-daulah, all of a sudden Mīr Madan, commander of the Artillery, fell on being hit with a cannon-ball. At the sight of this, the aspect of Sirāju-d-daulah’s army changed, and the artillerymen with the corpse of Mīr Madan moved into tents. It was now midday, when the people of the tents fled. As yet Nawāb Sirāju-d-daulah was busy fighting and slaughtering, when the camp-followers decamping from Dāūdpūr went the other side, and gradually the soldiers also took to their heels. Two hours before sun-set, flight occurred in Sirāju-d-daulah’s army, and Sirāju-d-daulah also being unable to stand his ground any longer fled. At around 11:00 a.m., Mir Madan, one of the Nawab's most loyal officers, launched an attack against the fortified grove where the East Indian Company was located, and was mortally wounded by a British cannonball. This cannonade was essentially futile in any case; the British guns had greater range than those of the French. At noon, a heavy rainstorm fell on the battlefield, wherein the tables were turned. The British covered their cannons and muskets for protection from the rain, whereas the French did not. As a result, the cannonade ceased by 2:00 p.m. and the battle resumed where Clive's chief officer, Kilpatrick, launched an attack against the water ponds in between the armies. With their cannons and muskets completely useless, and with Mir Jafar's cavalry who were closest to the English, refusing to attack Clive's camp, revealing his treachery, the Nawab was forced to order a retreat. By 5:00 p.m., the Nawab's army was in full retreat and the British had command of the field. The battle cost the British East India Company just 22 killed and 50 wounded (most of these were native sepoys), while the Nawab's army lost at least 500 men killed and wounded. The Battle of Plassey is considered as a starting point to the events that established the era of British dominion and conquest in India. Mir Jafar, for his betrayal of the Nawab Siraj Ud Daulah and alliance with the British, was installed as the new Nawab, while Siraj Ud Daulah was captured on July 2, in Murshidabad as he attempted to escape further north. He was later executed on the order of Mir Jafar's son. Ghaseti Begum and other powerful women were transferred to a prison in distant Dhaka, where they eventually drowned in a boat accident, widely thought to have been ordered by Mir Jafar. Mir Jafar as Nawab chafed under the British supervision, and so requested the Dutch East India Company to intervene. They sent seven ships and about 700 sailors up the Hoogley to their settlement, but the British led by Colonel Forde managed to defeat them at Chinsura on November 25, 1759. Thereafter Mir Jafar was deposed as Nawab (1760) and they appointed Mir Kasim Ali Khan, (Mir Jafar's son-in-law) as Nawab. Mir Kasim showed signs of independence and was defeated in the Battle of Buxar (1764), after which full political control shifted to the Company. Mir Jafar was reappointed and remained the titular Nawab until his death in 1765, while all actual power was exercised by the Company. As per their agreement, Clive collected £2.5 million for the company, and £234,000 for himself from the Nawab's treasury. In addition, Watts collected £114,000 for his efforts. The annual rent of £30,000 payable by the Company for use of the land around Fort William was also transferred to Clive for life. To put this wealth in context, an average British nobleman could live a life of luxury on an annual income of £800. 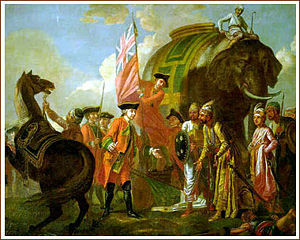 Robert Clive was appointed Governor of Bengal in 1765, for his efforts. William Watts was appointed Governor of Fort William on June 22, 1758. But he later resigned in favour of Robert Clive, who was also later appointed Baron of Plassey in 1762. Clive later committed suicide in 1774, after being addicted to opium. Confirmation of the mint, and all other grants and privileges in the Alinagar treaty with the late Nawab. An alliance, offensive and defensive, against all enemies whatever. The French factories and effects to be delivered up, and they never permitted to resettle in any of the three provinces. 100 lacs of rupees to be paid to the Company, in consideration of their losses at Calcutta and the expenses of the campaign. 20 lacs to Gentoos, Moors, & black sufferers at the loss of Calcutta. 7 lacs to the Armenian sufferers. These three last donations to be distributed at the pleasure of the Admiral and gentlemen of Council. The entire property of all lands within the Mahratta ditch, which runs round Calcutta, to be vested in the Company: Also, six hundred yards, all round, without, the said ditch. The Company to have the zemindary of the country to the south of Calcutta, lying between the lake and river, and reaching as far as Culpee, they paying the customary rents paid by the former zemindars to the government. Whenever the assistance of the British troops shall be wanted, their extraordinary charges to be paid by the Nawab. No forts to be erected by the Nawab's government on the river side, from Hooghley downwards. ↑ Project South Asia, This resulted in the Treaty of Alinagar on February 7, 1757 which gave the East India Company control of Bengal. Retrieved March 13, 2008. ↑ S.C. Hill, The Indian Record Series, Bengal in 1756-7 (London, 1895-1905). ↑ Ghulam Husain Salim, Riyazu-s-Salatin. Retrieved December 3, 2007. ↑ Project South Asia, South Dakota State University, Robert Clive's Letter to the Select Committee. Retrieved December 3, 2007. Datta, K.K. Siraj-ud-daulah. Bombay: Orient Longman. Gupta, B.K. Sirajuddaulah and the East India Company, 1756-1757. Leiden: E. J Brill, 1962. Hill, S.C. The Three Frenchmen in Bengal. Retrieved December 3, 2007. Sarkar, J.N. The History of Bengal. Dhaka: University of Dhakha, 1968. History of "Battle of Plassey"